The “witness list” for these “hearings” included many regulars on the UFO lecture circuit: former astronaut Edgar Mitchell; UFOlogist Stanton Friedman; and Steven Greer Founder of The Disclosure Project The Disclosure Project, The Center for the Study of Extraterrestrial Intelligence (CSETI) and The Orion Project. (Just FYI, among the 42 witnesses, only two were women….) It’s important to note that the government officials who spoke at this event were all FORMER government officials. It’s also worth noting that the fact that an event takes place at the National Press Club means only that the event’s organizers can afford to rent space there. Why is Doctor Linda writing a post about this media event? Because a good friend of mine asked me about the veracity of some statements made there. “Blake (1979) called UFOlogy “a science in development,” characterizing it as “an intellectual product of social groups not of the intellectual elite” (p. 333). That the study of unidentified flying objects (UFOs) has come to be known as an “-ology” is but one small aspect of that development. As Collins and Pinch (1982, 1979) reported, acquiring the trappings of scientific legitimacy is a standard tactic of legitimation employed by paranormal scientists. And as Bourdieu (1991) observed, names and labels are important, serving as a means of creating social reality and the power and authority that operate in that reality. UFOlogy has created for itself the labels and other trappings of legitimate science, and media coverage plays a role in this construction of legitimacy. The contributions of journalists to construction of the concept of UFOs (and, concomitantly, UFOlogy) are worth examining, Blake (1979) said. While, as he noted, many journalists, official sources, and members of the scientific community have ridiculed reports of UFOs and deemed the subject “unsuitable for serious scientific study” (p. 330), nonetheless official attention and mass media coverage have made and kept UFOs and UFOlogy salient over the years (see Smith, 1983). One strategy that UFOlogists have employed to establish credibility for UFOs as a legitimate research subject and themselves as legitimate researchers, Blake said, is to rhetorically construct UFOs as phenomena in the natural world, thus locating them inside the boundaries of legitimate science. Another strategy has been to locate the UFO phenomenon outside the boundaries of conventional science, where the authority of conventional science does not apply. UFOlogist J. Allen Hynek (see below) sorted scientists working on “the UFO problem” into two groups: those who treat it “with ridicule and contempt, refusing even to examine it, denouncing the subject out of hand”; and those who “maintain — or might come to believe after examination — that there is a strong possibility that UFOs are purely psychological phenomena, that is, generated by individual or group mental activity” (Hynek, 1972, as cited in Smith, 1983, p. 37). In addition, UFOlogists reportedly are divided among those who locate the abduction phenomenon on their “turf” and those who argue that validating abduction accounts detracts from the scientific credibility of UFOlogy (Rosen, 1999). But even some of those UFOlogists who reject abduction claims reportedly may “go to great lengths…to establish that they believe in extraterrestrials and that that aliens have visited Earth” (n.p.). UFOlogists have adopted the standard scientific methods of observing, data collection, record keeping and reporting. As Blake (1979) reported, UFOlogy “has developed as a distinct body of data studies by distinctly ‘credentialed’ investigators, some of them affiliated with organizations devoted to the study of UFOs” (p. 315). UFOlogists also have a substantial archive of official records to tap for validation (see Smith, 1983). The U.S. Air Force studied UFOs from 1948 to 1969, receiving over 12,000 reports of sightings and commissioning several projects such as Sign, Grudge, Blue Book, and the so-called Condon report. Records of congressional hearings on UFOs are available along with reports on the American Association for the Advancement of Science’s 1969 UFO symposium in Boston (Smith, 1983). The “grassroots” Mutual UFO Network (MUFON), established in 1969, publishes its own journal, holds symposia and produces proceedings. The American Institute of Aeronautics and Astronautics, an association of aerospace professionals, published an appraisal of the UFO “problem” in 1970. In 1976, the Congressional Research Service of the Library of Congress produced a comprehensive report on the history and status of UFO sightings and studies, updating it in 1983. Astronomer J. Allen Hynek (who died in 1986) played a role in producing some of the official record on UFOs described above (Smith, 1983). Hynek was one of the first properly credentialed scientists to establish and maintain credibility and authority as a UFO researcher and a legitimate scientist as well. Hynek reportedly began exploring the UFO phenomenon as a skeptic but later came to believe that UFO reports pointed to a mystery that needed to be solved, though he often asserted that he was not a “believer” in UFOs (Smith, 1983). With a Ph.D. in a legitimate science and a professorship at the well known Northwestern University, he served as a consultant to the U.S. Air Force for its UFO studies in the 1960s. Hynek also testified to Congress on the subject. In 1972 Hynek published The UFO Experience: a Scientific Inquiry (Chicago: Henry Regnery), and in 1973 he founded the Center for UFO Studies (CUFOS) at Northwestern. CUFOS established its own journals (which continue to publish today), the Journal of UFO Studies (JUFOS) and the International UFO Reporter. One of Hynek’s collaborators, Jacques Vallee, also was able to develop credibility and authority both as an UFOlogist and a legitimate scientist. Vallee, who has a Ph.D. in computer science from Northwestern, appears to have constructed separate public identities for himself, as an UFOlogist and a venture capitalist specializing in Silicon Valley business development. A biography posted at his personal Web site10 identifies him as a general partner of SBV Venture Partners, a Silicon Valley investment group, and says about his interest and expertise in UFOlogy only that he “has had a long-term private interest in astronomy, in writing and in the frontiers of research, notably unidentified aerial phenomena [UAP].” His corporate biography11 cites his degrees in mathematics, astrophysics, and computer science and his work with the Shell and RCA corporations, Stanford University and the U.S. government but does not make any reference to his interest in UFOs (or UAP). One must consult a source other than Vallee’s biographies for a complete list of his publications (I consulted the Library of Congress catalog) — his UFOlogy books include Anatomy of a Phenomenon: Unidentified Objects in Space — A Scientific Appraisal (1965), Challenge to Science: The UFO Enigma (1966), Edge of Reality: A Progress Report on UFOs (1975, with J. Allen Hynek), Confrontations: A Scientist’s Search for Alien Contact (1990), and Forbidden Science: Journals 1957-1969 (1992). His “real science” books include Network Revolution: Confessions of a Computer Scientist (1982) and Heart of the Internet: An Insider’s View of the Origin and Promise of the On-Line Revolution (2003). One study of the potential scientific value of studying UFOs likely drew media coverage because it was convened by Stanford University physics professor Peter Sturrock — a fully credentialed and legitimate scientist attached to an elite institution, a familiar name in UFOlogy, and a founder of the Society for Scientific Exploration. The Sturrock-led study was financed by philanthropist Laurance Rockefeller (now deceased) and conducted by a panel of authoritatively credentialed “senior physical scientists,” as the authoritative Science magazine described them (Kestenbaum, 1998, p. 21). The study reportedly concluded that some UFO sightings warrant scientific study. Panel co-chair Thomas Holzer, a geophysicist at the National Center for Atmospheric Research, was quoted in Science, “Anything not explained is something science at some level ought to be interested in” (p. 21). University of Maryland physicist Robert Park, spokesman for the American Institute of Physics, was quoted in Science deeming the study of UFOs “a total waste of time…. Calling in all the people who have seen strange things just gets you a roomful of strange people” (p. 21). Even The New York Times made note of this group’s report, in its Science Times section (Wade, 1998). An initiative undertaken by cable television’s Sci Fi Channel (now Sy Fy) is worth considering here because it was framed as an effort to construct scientific authority for UFOlogy but took the form of a media campaign and served the purpose of promoting TV programming. Sci Fi initiated a series of activities that Sci Fi officials said were intended to convince government officials to take UFOs seriously. These activities were also part of a publicity campaign for “Taken,” a Sci Fi mini-series on abduction.Sci Fi described “Taken” as fiction based on true stories. The series was broadcast in December 2002. Sci Fi said it sponsored the various elements of its “Taken” campaign “to shed light on the facts behind the fiction” of the series. They included a series of online “chats” with UFO experts; the commissioning of a Roper public opinion poll on UFOs (results released November 2002); a November 2002 symposium in Washington, D.C., on “interstellar travel and unidentified aerial phenomena”; a November 2002 symposium in New York on “the reality of the abduction phenomenon”; and an October 2002 National Press Club briefing in Washington on the formation of a Coalition for Freedom of Information (CFI). The CFI was a Sci Fi-sponsored project of the Washington public relations and lobbying firm PodestaMattoon, which orchestrated the network’s UFO campaign.John Podesta, a principal in PodestaMattoon, served as White House chief of staff in the Clinton Administration. Along with Sci Fi representatives, Podesta participated in the Press Club announcement of the CFI. One journalist described Sci Fi’s campaign as “seeking the truth through savvy marketing” (David, 2002). Sci Fi’s Washington symposium took place on the campus of George Washington University. I attended this event to observe the rhetoric of UFOlogy in action, and the following account of it is based on my observations (all quotes are taken from my notes). The university’s vice president for academic affairs said his institution and the Sci Fi Channel had a common interest in promoting interdisciplinary scientific research and “dispassionate discussions” about controversial subjects.A well known journalist with the Public Broadcasting System, Ray Suarez, moderated the event — “to keep things honest,” he told me. The panel of seven experts assembled for this UFOlogy symposium included five Ph.Ds, among them physicists Michio Kaku (a science popularizer as well as a college professor) and Peter Sturrock (of Stanford) and UFOlogist/venture capitalist Jacques Vallee. Given the importance of labeling in constructing authority, I should note that while I am referring to this event as a UFOlogy symposium, the Sci Fi Channel did not use this term in publicizing the event, and speakers at the event avoided use of the term “UFO,” employing the alternative term “unidentified aerial phenomenon” (UAP). Credentials, expertise and authority were emphasized in speaker introductions, biographies and presentations. Physicist/astrophysicist Bernard Haisch, director of the California Institute for Physics and Astrophysics and keeper of the Web site http://www.ufoskeptic.org, said at the symposium that “the field is full of nonsense and hoaxes” but noted that legitimate scientific research “started out this way.” Haisch said research journals and research societies are helping to establish “respectability” for UAP studies (see below regarding one of Haisch’s journal contributions.) In his remarks at the symposium Jacques Vallee said that, while “this has not been done so far…reports of the phenomenon can be studied objectively with the methods of today’s science without pre-judging their nature. New, radical hypotheses may be needed to account for the phenomenon.” Some panelists recommended that the National Aeronautics and Space Administration or National Science Foundation should devote some funding to the study of UAPs. Speakers discussed at length the need to (and the how-to) persuade the mass media to take their stories seriously. One speaker said the media should “take a leadership role” in telling the story of UAPs. The Associated Press (Associated Press, 2003) later reported on a Sci Fi Channel-backed lawsuit to make NASA divulge records of “a UFO that reportedly crash landed and was recovered by government workers” (para. 1) in 1965. “The cable network announced in June,” the story reported, “that it was backing the effort to research the Kecksburg incident in promoting a documentary, ‘Out of the Blue,’ which examined various UFO reports” (para. 11). This story noted, “Sci Fi channel officials said they’re looking for an explanation of what occurred. They’re also looking for viewers. A November 2002 documentary on the suspected 1947 UFO crash in Roswell…was the highest-rated special in the network’s 11-year history…seen by nearly 2.4 million people” (para. 13-14). Anthropic reasoning applied to inflation theory reinforces the prediction that we should find ourselves part of a large, galaxy-sized civilization…. Furthermore, superstring and M-brane theory allow for the possibility of parallel universes, some of which in principle could be habitable. In addition, discussion of such exotic transport concepts as ‘traversable wormholes’ now appears in the rigorous physics literature (p. 43). Consequently, the authors asserted, the proposition that humans may be the only intelligent life in the universe is “inconsistent with new developments in our best current physics and astrophysics theories” (p. 43). Thus scientists should consider seriously investigating UFO reports, they said. Space.com (David, 2005) reported that, according to Haisch, many scientists have “been turned off” by UFO claims that have turned out to be the products of “misinterpretations, delusions, and hoaxes” (para. 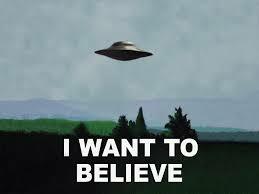 16), and consequently they dismiss UFOs as a legitimate subject of study. A so-called “X-Conference” held in the Maryland suburbs of Washington, DC, in 2004 was, its organizers asserted, designed to attract the attention of journalists and public policy makers to the subject of UFO visitations, “extraterrestrial engagement and societal denial,” according to a press release about the conference. I attended this conference to observe the rhetoric of UFOlogy in action. Phenomena magazine (Dolan, 2004) judged that the X-Conference failed to meet its aim of generating media coverage and government action — neither the Washington Post nor The New York Times covered the event. While the conference was not covered as national news, it was covered, however, as a local event by a local newspaper. [Electronic version]. Associated Press, n.p. Blake, J. A. (1979, March). UFOlogy: the intellectual development and social context of the study of unidentified flying objects. In R. Wallis (Ed. ), On the margins of science: the social construction of rejected knowledge (pp. 315-337). Sociological Review Monograph 27, University of Keele. Bourdieu, P. (1991). Language and symbolic power (J.B. Thompson, Ed. ; G. Raymond and M. Adamson, Trans.). Cambridge, MA: Harvard University Press. Collins, H. M. & Pinch, T. J. (1979, March). The construction of the paranormal: nothing unscientific is happening. In R. Wallis (Ed. ), On the margins of science: the social construction of rejected knowledge (pp. 237-270). Sociological Review Monograph 27, University of Keele. Collins, H. M. & Pinch, T. J. (1982). Frames of meaning: the social construction of extraordinary science. London, Boston: Routledge and Kegan Paul. David, L. (2002, October 25). UFOs: seeking the truth through savvy marketing. Space.com, n.p. Deardorff, J., Haisch, B., Maccabee, B. & Puthoff, H. (2005, Jan.-Feb.). Inflation-theory implications for extraterrestrial visitation. Journal of the British Interplanetary Society, 58, 43-50. Dolan, R. (2004, April 27). The X-Conference: not lights in the sky, but lies on the ground. Phenomena Magazine, n.p. Gugliotta, G. (2002, November 18). A trip as far away as space-time will allow: scientists contemplate ideas, impossibilities of interstellar transit. Washington Post, p. A12. Kestenbaum, D. (1998). Panel says some UFO reports worthy of study. Science, 281, 21. Lehmberg, A. (2004). Re: X-Conference draws hundreds to Gaithersburg (message posted to the mailing list UFO UpDates). Rosen, M. (1999, July 19). New book debunks abduction evidence. Space.com, n.p. Smith. M. S. (1983). The UFO enigma (Revised and updated by G. D. Havas.) Report No. 83-205 SPR.Washington, DC: Congressional Research Service. Stanley, B. W. (2004, April 21). X-Conference draws hundreds of believers to Gaithersburg [Electronic version]. Gaithersburg (MD) Gazette. Wade, N. (1998, June 30). Science watch: recognizing what is real. The New York Times, p. F4.